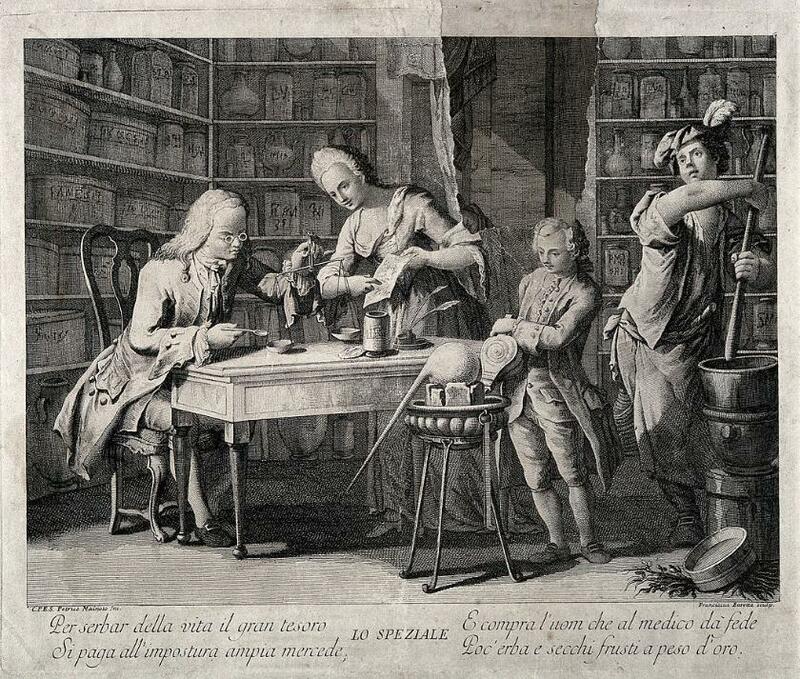 Above: An apothecary making up a prescription using scales, his wife holds a recipe for him and two assistants are working with the bellows and pestle and mortar. In medieval times apothecaries sold wine, herbs and spices - in London they were members of the Grocers' livery company. By the 1500s they were mainly preparing and selling substances for medicinal purposes, and in 1617 separated from the grocers' company. A legal case in 1704 ruled that they could prescribe and dispense medicines. Pharmacists (and later, chemists and druggists) prepared and dispensed medicines. Although much of their work overlapped, the emphasis (as I understand it) was that the apothecaries prescribed medicines, and the pharmacists prepared them. The Medical Register has sections for the separate disciplines, but some entries, as for Ashburton, combine the two. December 1802 Proceedings in Parliament - Commons. A petition from the chemists of Ashburton against the Medicine Act was presented. An earlier Act had imposed stamp duty on all patented medicines and some unpatented ones. In addtion, some vendors had to take out a licence. Later Acts, including that of 1802, taxed more medicines. 'Persons who have obtained certificates of their fitness and qualification to practise as apothecaries and to act as assistants, from August 1st 1816 to July 31st 1817. Nathan Beck, Margery Wootton and Mary Wootton - all in North Street. A dwelling house with shop and fixtures was to let in 1833. Close to the market, it had been used as a druggist's for 30 years. Mr R Snow, of 13 Market Street, Devonport, was the proprietor. 1837 R W Rexford warned purchasers of Devonshire Sauce to make sure that the article was the genuine Rexford article: they had to check that the cork was sealed with the impression Rexford, chemist, Ashburton, and that the label had his signature. 1843 Mr T T Herron, chemist of Ashburton, married Mary Turner at Eldad Chapel, Plymouth. When Mrs Gillard, relict of the late Sylvanus Gillard, died in 1850 she was said to be the mother of Mr T Gillard, chemist and druggist of Ashburton. Frederick Herron was a chemist and druggist in West Street in the 1851 census. 33 years old, he had been born in Devonport. In 1852 G W Yolland, an Ashburton chemist, married Miss Maria Hext at Landscove church. 1857. The Ashburton agent for Cooper's Wheat Dressing, a preparation to aid seed germination, was Pearce, Chemist. In 1860 Du Barry's delicious health restoring Revalenta Arabica Food could be bought from the Ashburton agent, C W Prentis, chemist. It promised relief from digestive and liver complaints. George Beck, Chemist and Grocer, East St.
John S D Pearce, Chemist and Druggist, West St.
Nathan Beck, Retired Chemist, East St.
1862 John Charles Hurst, a chemist from Ashburton, gave evidence at the inquest into the death of W[illiam] Foot. Daniel Skews, an Ashburton rifle volunteer, had allegedly fired a blank cartridge at close range. Mr Hurst stated that about a minute before the incident he had told Skews off for firing his rifle close to the ear of a Mr Coneybeare. In 1879 Abraham Hill, chemist, was brought before the Petty Sessions on a charge of selling adulterated violet powder. The case was dismissed. Violet powder was a product made from cornstarch or potato flour, perfumed with a violet scent and used on babies. A year previously a baby had died, and when the powder was analysed it was found to contain a large quantity of arsenic. The funeral of George Beck, chemist, took place in 1891. An old-established tradesman of the town, he was described as being of a 'very jovial temperament'. He had been Secretary of the Loyal Ashburton Lodge of Oddfellows, and many Oddfellows attended the funeral, wearing white-edged black sashes with a sprig of thyme. Most of the information about Daniel comes from the research of Chris Kahaya, to whom many thanks. I have added to it where I could. Daniel Ogilvie Evans' birth was registered in Basford in the September quarter of 1841. He was with his father, a widower, in the 1851 census for Burnley, Lancashire, together with 5 siblings, the youngest only a month old. Another sibling, Joseph James Evans, was born in Newfoundland. Daniel's father was an independent minister. By 1911 this brother, Joseph James Ogilvie Evans, was a dispensing chemist and dentist in Teignmouth. Daniel registered as a dentist on November 5th 1878. Records such as the 1881 census for Farnworth in Lancashire state that he was born in Heanor, Derbyshire. By this time Daniel, a dentist, chemist and druggist, was married to 24 year old Annie M, and they had a six month old son, Kenneth H Evans. Daniel Ogilvie Evans had married Annie Maria Williamson in the Kensington district in the March quarter of 1879. Kenneth Horsefall Evans' birth had been registered in Bolton in the December quarter of 1880. His mother's maiden surname was Williamson. Above: A business card for D Ogilvie Evans. For some time the back of it was used to display one of the hymn numbers at the Methodist Church - the No. 6. There was a tea for the children of the Poundsgate Wesleyan Sunday School on the anniversary in July 1886. After the evening service the sight of a large fire balloon should have provided entertainment, but unfortunately a strong breeze prevented it from being fully inflated, and it became torn in several places. The balloon had been lent by Mr Evans, chemist, Ashburton. By 1891 the family were in West Street, Ashburton, in a building in the row of properties between the Duke's Head and the London Inn*. Their son, Wilfred Joseph Ogilvie Evans, was with Daniel and Annie on the census. Wilfred's birth was registered in the December quarter of 1887, in the Newton Abbot registration district. *Probably what is now No.7, as this is where they were in 1911. See below. Daniel died on the 16th May 1919, leaving an estate valued at £1065 18s 9d gross. Probate was granted to his widow, Annie Maria Evans. 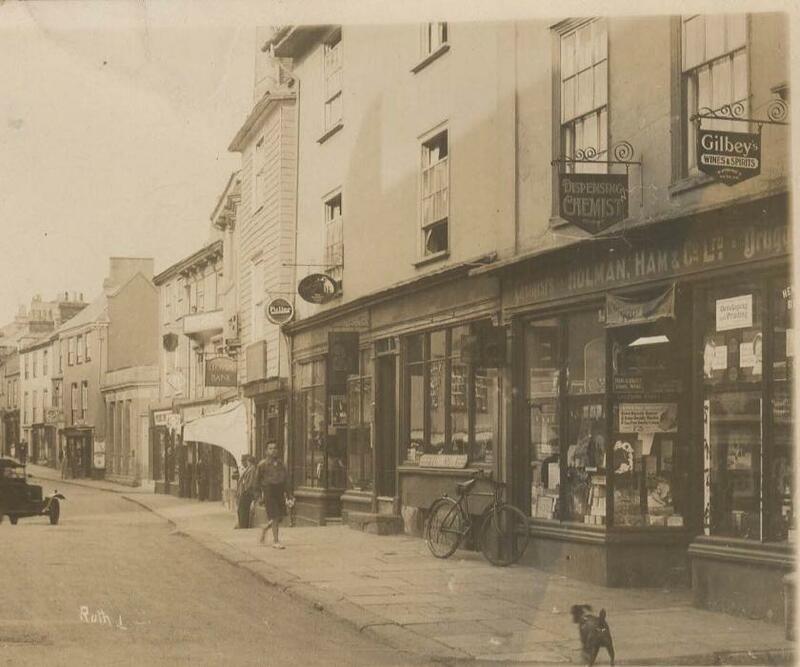 The Exeter and Plymouth Gazette noted that he 'was one of the most respected tradesmen in the town', who had been in business in West Street for nearly 30 years. His health had been failing ever since the death of one of his sons* two years before. Many thanks to Chris Kahaya for the above research. 1923 The Plymouth and District's Pharmacists' Assocation were having their annual excursion by charabanc in July. The itinerary included Two Bridges, Dartmeet, Widdecombe in the Moor and Ashburton, returning via Ivybridge. High tea was at the Golden Lion Hotel, Ashburton, where the party were to meet up with a contingent from Exeter. 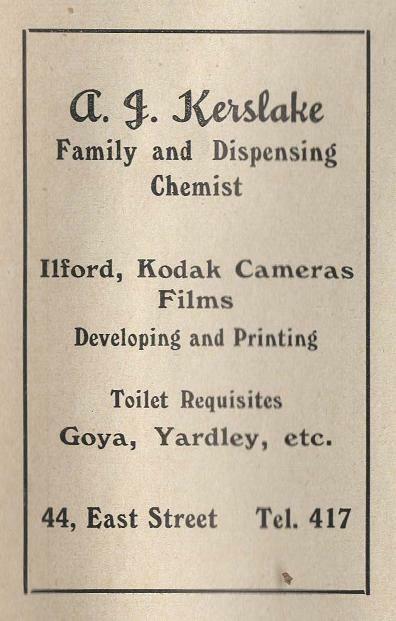 Ernest Rt Moss is shown as a chemist at 44, East St in Kelly's Directory 1935. He had been in the town since at least 1906, when E R Moss, chemist etc. East Street advertised Moss's Influenza Cure at 1s a bottle. Mrs Elizabeth Ann Moss died in September 1938. She had come to Ashburton about 38 years before, after marrying Mr Ernest R Moss, a chemist and druggist. Mr Moss was secretary and a deacon of the Congregational Church. In 1948 Alan John Kerslake, trading as E R Moss at 44 East Street, gave formal notice that he was applying at the General Annual Licensing Meeting for a licence to sell medicated wines and cider. Mrs A E Kerslake was the owner of the premises. Alan J Kerslake had married Amy E Brendon in 1937. The daughter of Mr and Mrs E J Brendon of North St, Amy had been the town's first carnival queen. Right: Advertisement for A J Kerslake, Official Guide of Ashburton, 1950s. Above: Advertisement in the Official Guide of Ashburton, 1950s. 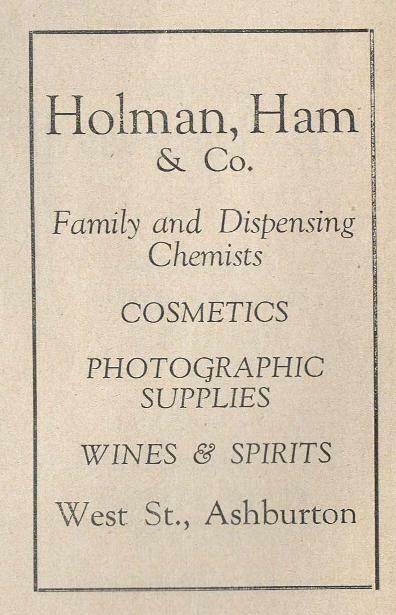 According to http://medicalgentlemen.co.uk John Holman, a druggist in Exeter, founded the firm of Holman, Ham and Co with his son-in-law James Ham. John died in 1828. 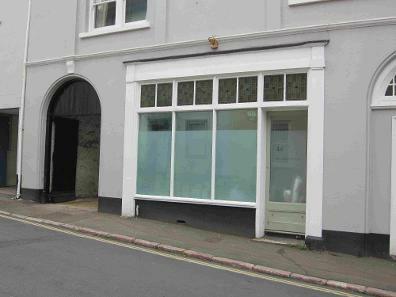 The firm eventually had 'several chemist shops' in Devon. There may or may not be a connection to John Holman, a chemist and druggist of George Street, Plymouth in 1833. He married Harriet Matterface in Ashburton in August. According to the 1851 census for St Andrew, Plymouth, 48 year old John had been born in Devonport. In 1924 men wishing to try the Durham-Duplex razor could obtain one from Holman, Ham and Co., Ashburton. Other branches mentioned were Exeter, Teignmouth, Crediton, Paignton, Sidmouth, Exmouth, Brixham and Totnes. Above: Holman, Ham and Co. is the property on the extreme right.